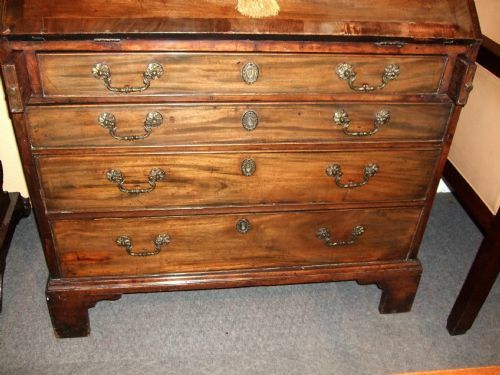 Superb Colour & Patination, with Original Locks & Keys. 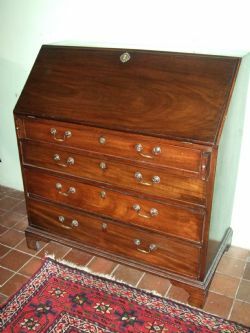 George 3rd Mahogany Bureau C.1780 with Inlaid Fitted Interior & Secret drawer, Good Cuban Mahogany. 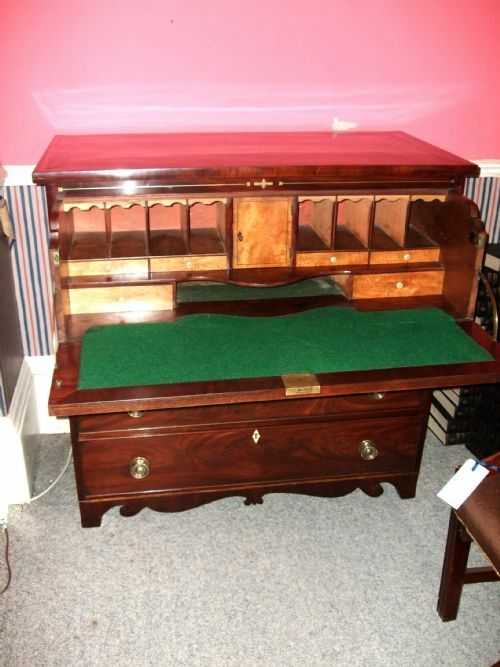 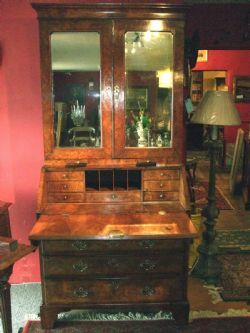 18thC Small Mahogany Bureau with Fitted Interior & Well. 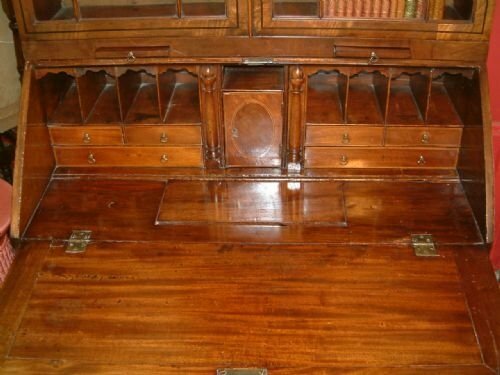 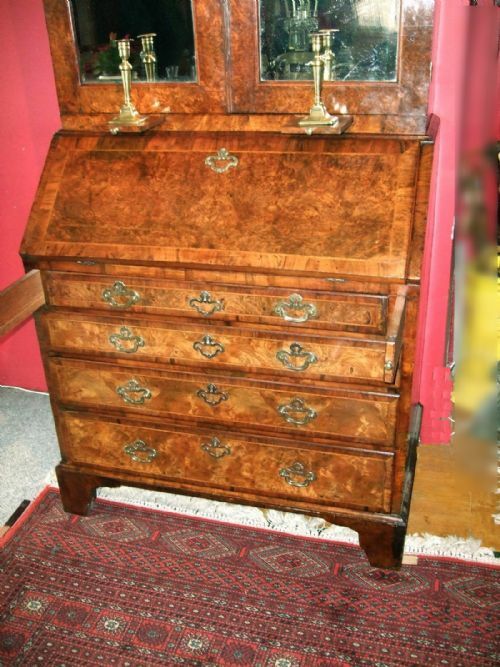 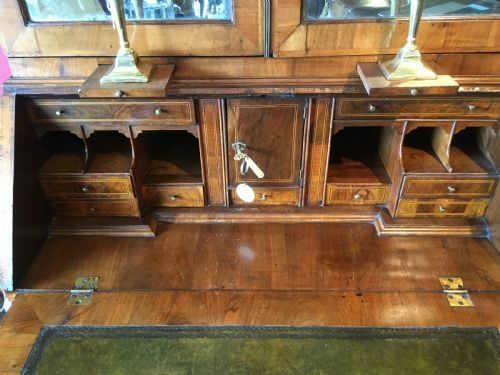 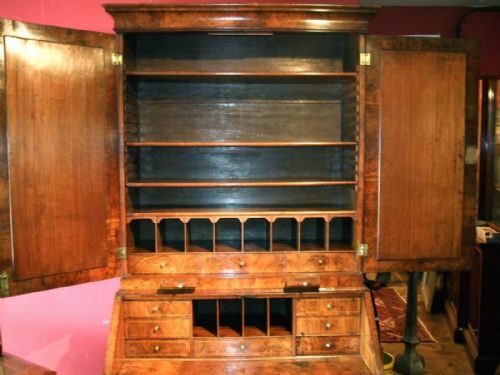 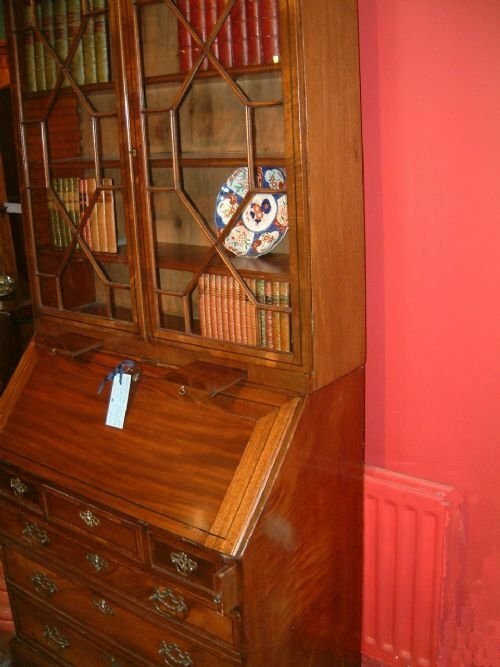 George 1st Period Walnut Bureau Bookcase with Candle Slides, the Glazed Upper Section Revealing Shelves Pigeon Holes & Drawers above a Fall Flap Enclosing the Writing Desk with Pigeon Holes and Drawers, above 4 Graduated Drawers with Brass Handles also with Keys for the Locks. 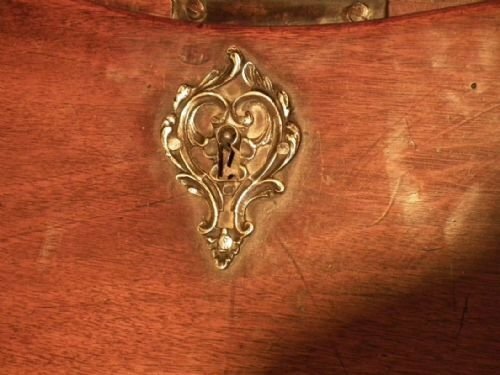 Right Hand Mirror Lower Area of Imperfect Silvering. 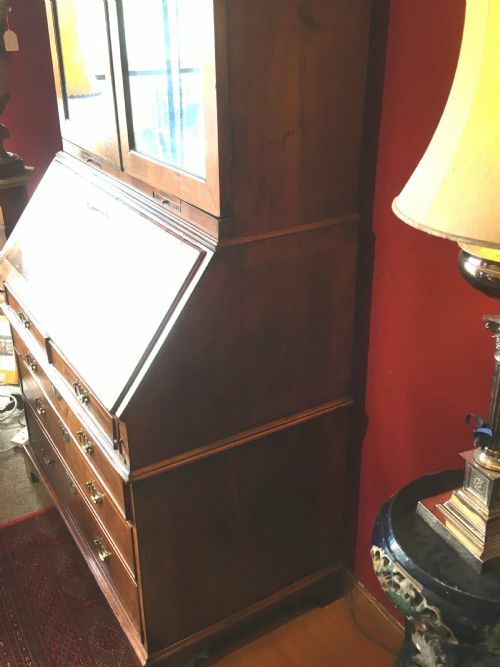 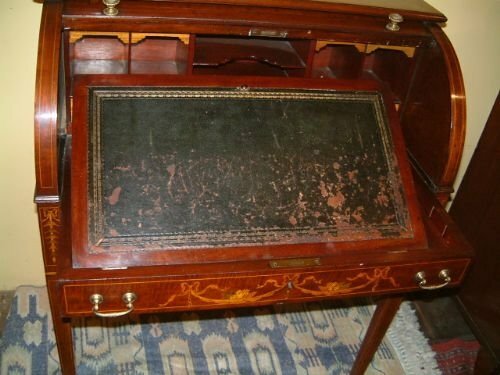 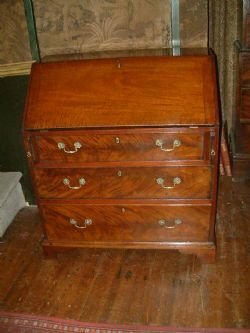 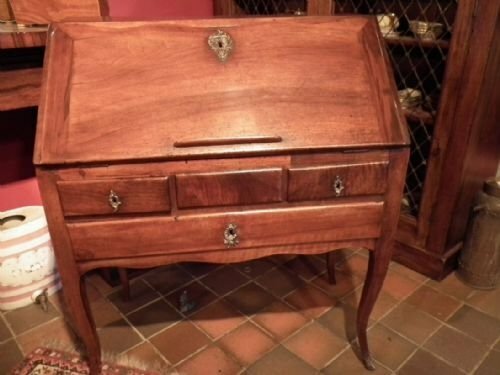 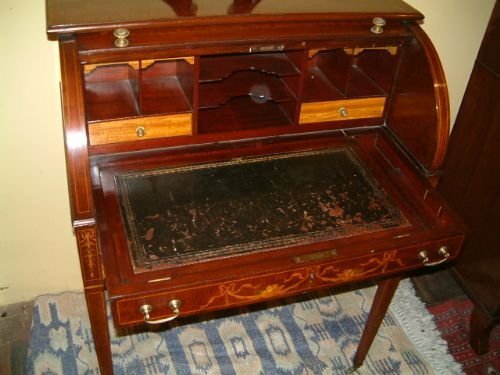 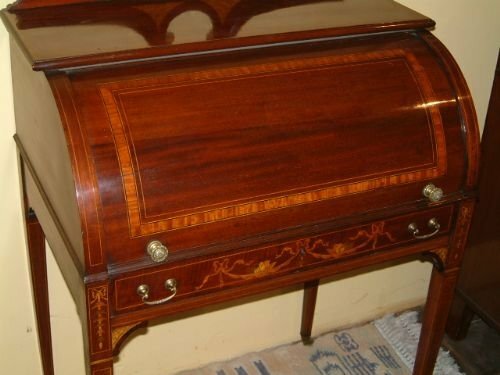 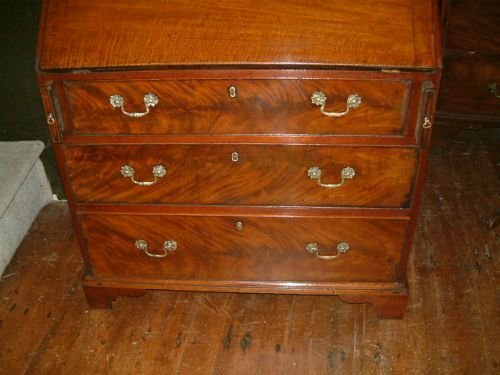 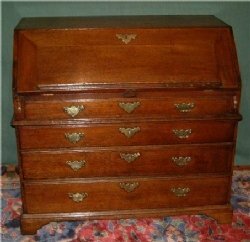 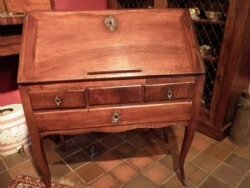 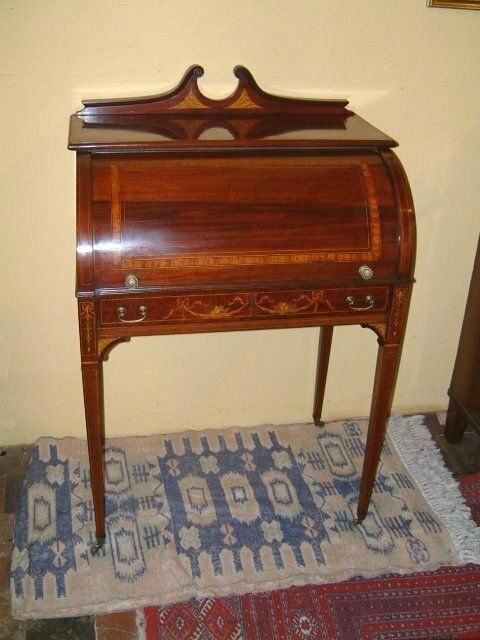 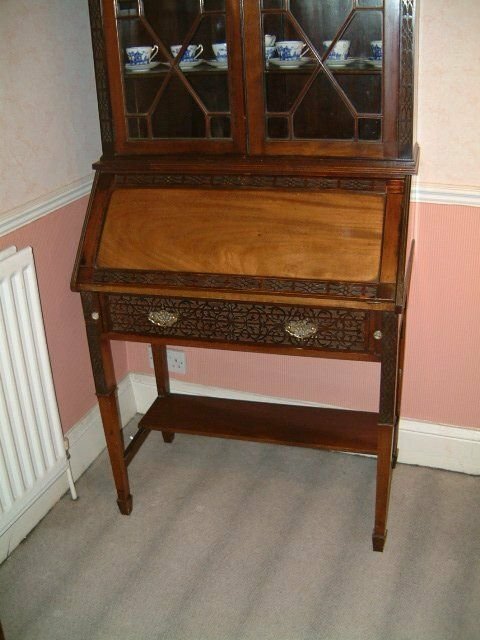 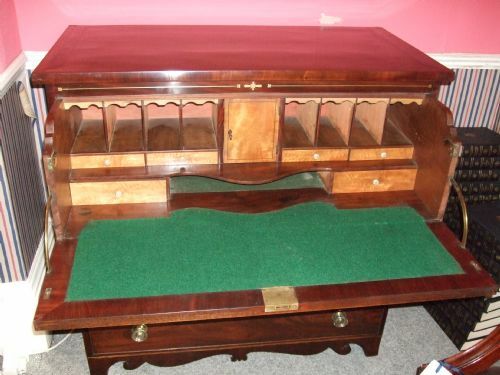 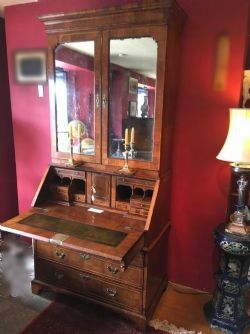 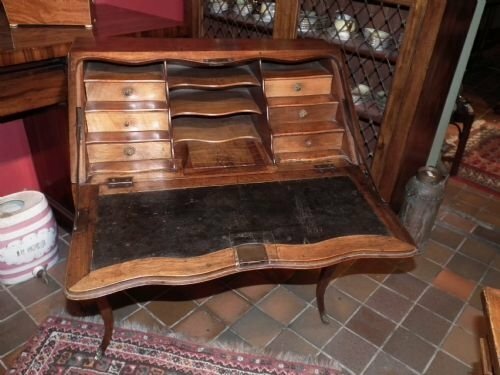 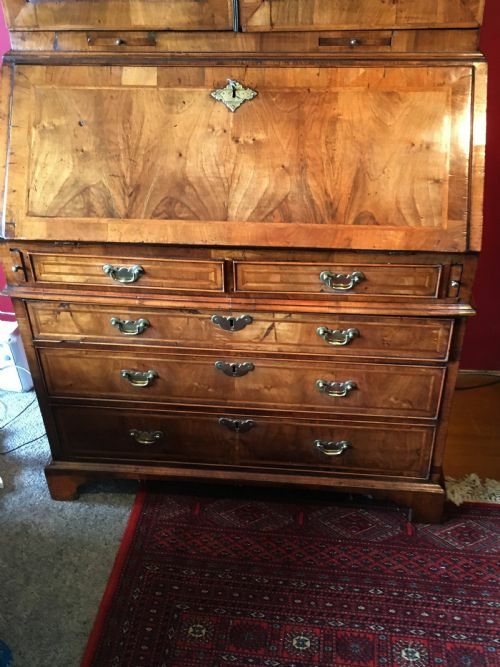 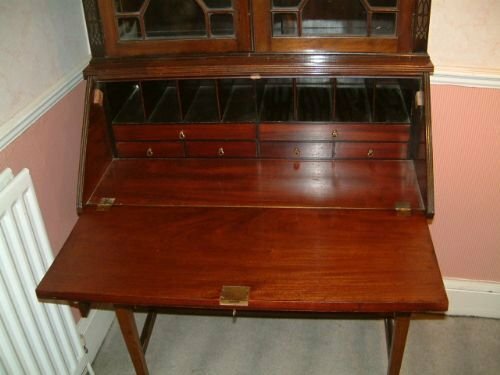 Superb Edwardian Sheraton Revival Inlaid Mahogany Cylinder Writing Desk, the Cylinder Front Revealing a Fitted Interior with Satinwood Drawers & Pigeon Holes, the Writing Slope Drawer with Original Leather which Raises with a Pen compartment to the Right, the Inlay is Beautiful with Garlands & Flowers etc. 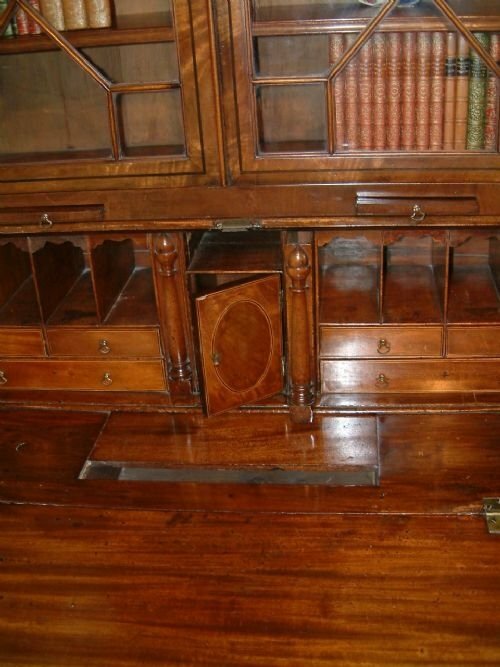 18th Century Mahogany Bureau Bookcase Inlaid with Ebony Lines. 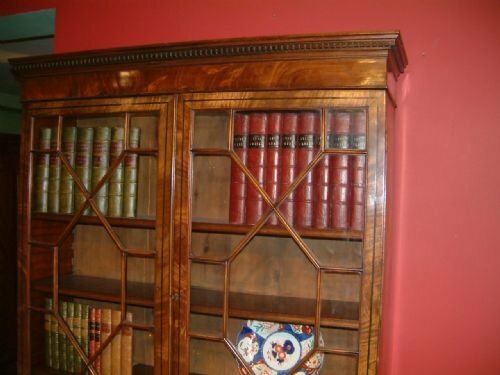 The Dentil Cornice above Astragal Glazed Doors with Candle Slides Below. 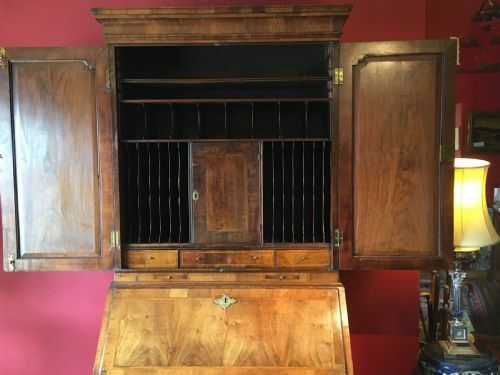 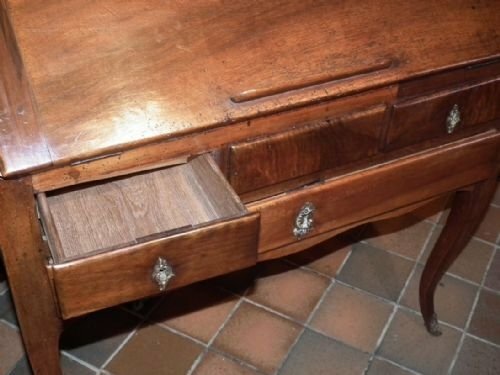 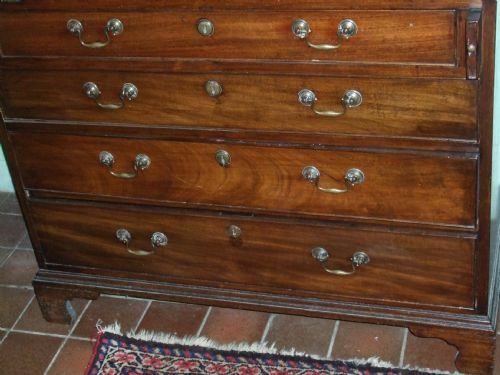 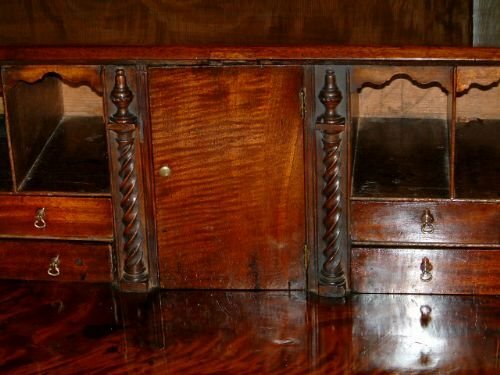 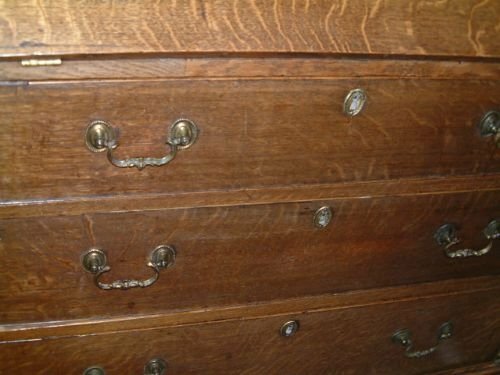 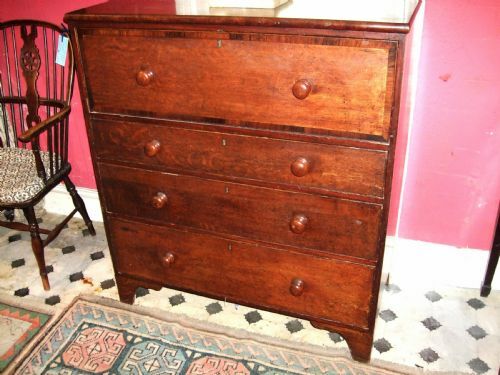 The Fully Fitted Bureau with Secret Dawers Pigeon Holes and a Central Sliding Well above Three Short & Three Graduated Long Drawers Supported on Bracket Feet, we feel the Top Section is associated possible 19th Century. 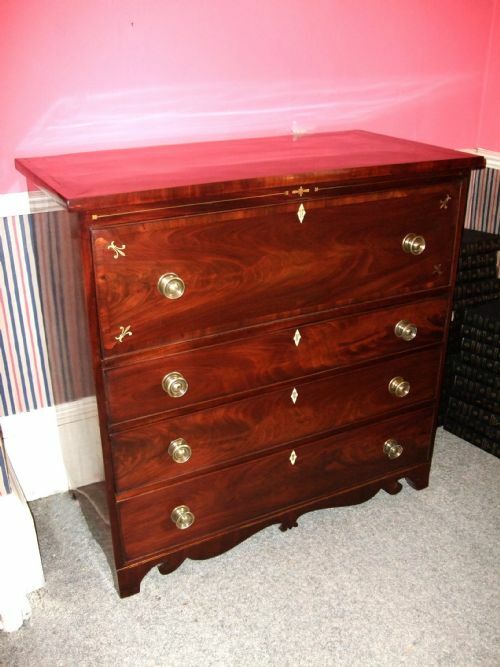 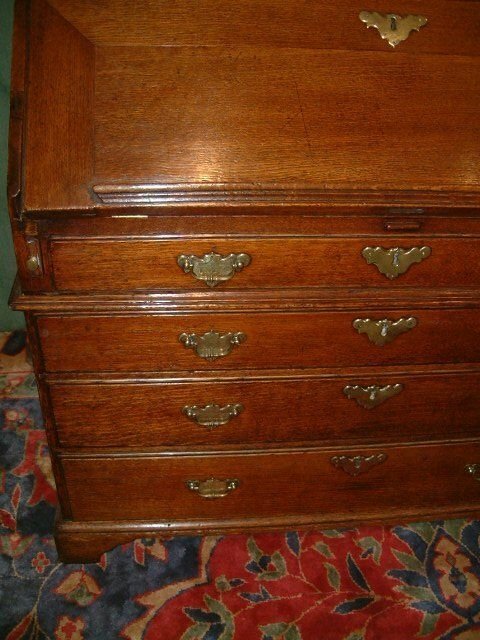 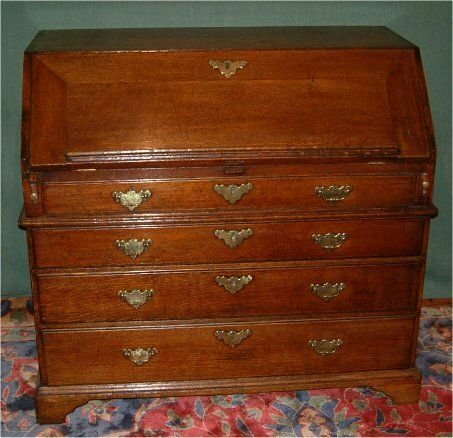 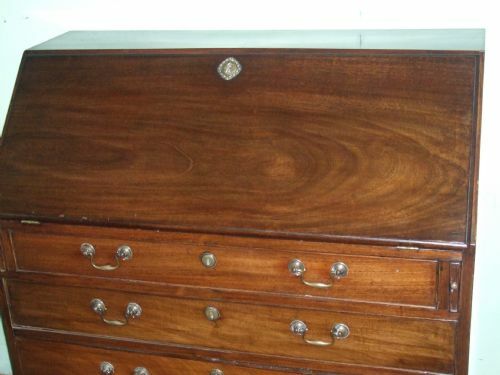 Regency Mahogany Brass Inlaid Secretaire Chest. 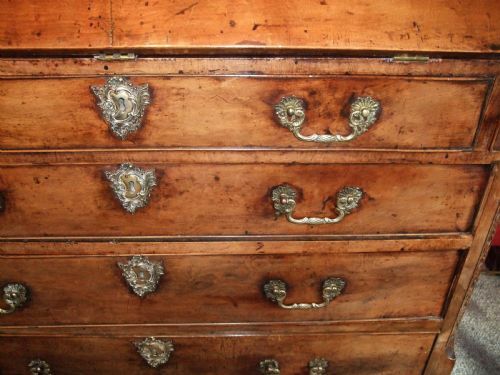 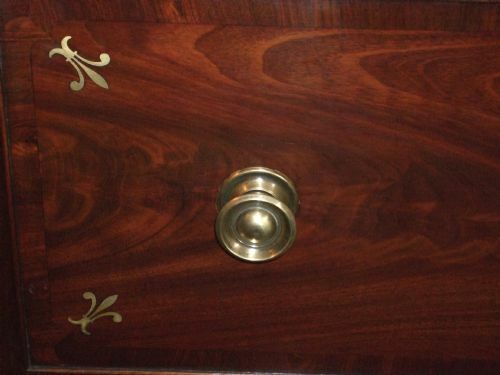 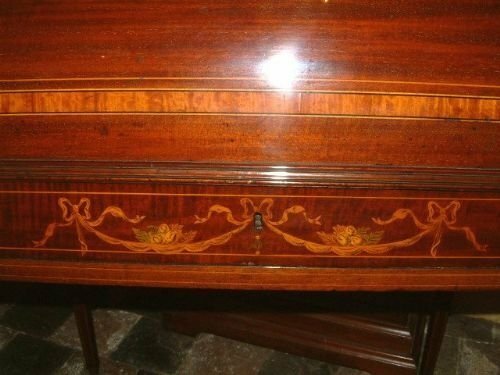 Inlaid with Brass Fleur de lys motifs and Boxwood Lines also Crossbanded, Original Brass Knobs. 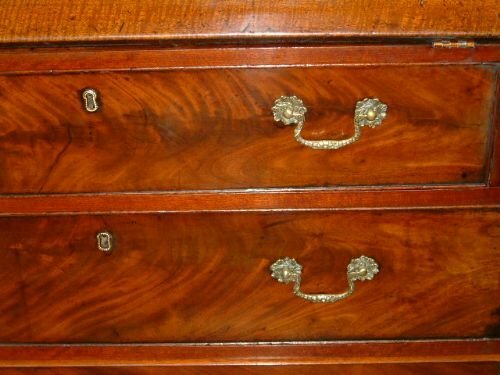 The Secretaire Drawer with Satinwood and Inlaid lines. Bureau, with Lovely Fitted Interior, Brass Handles Supported on Bracket feet. 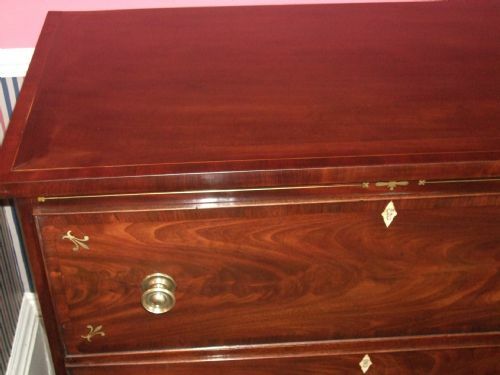 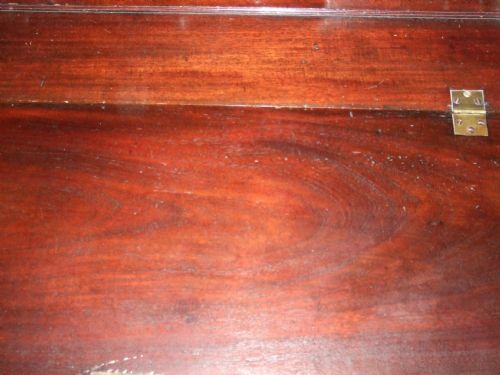 Good Flame Mahogany to the Drawer Fronts. 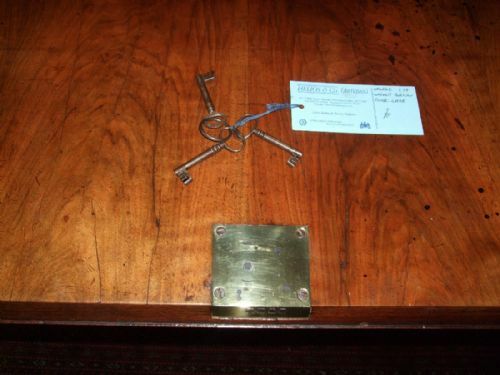 The Fall Front Revealling a Fully Fitted Interior with a Well, above Two Short & One Long Drawer,Beautiful Brass Key Escutcheons Supported on Cabriol Legs Terminating in Brass Sabots. 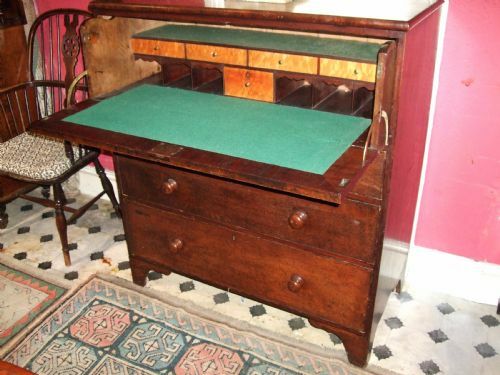 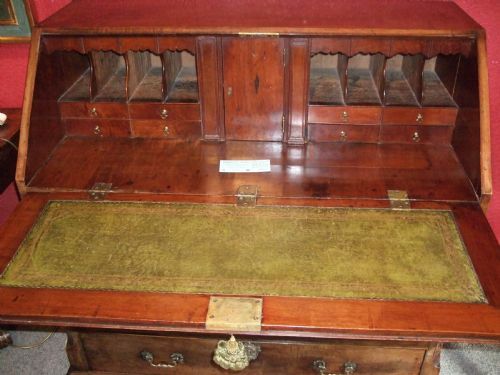 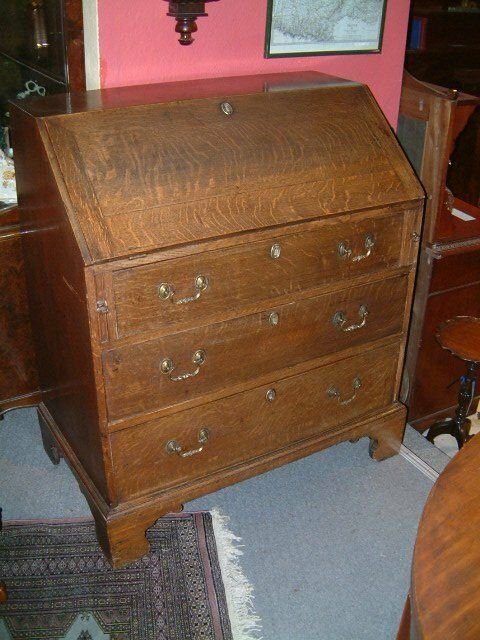 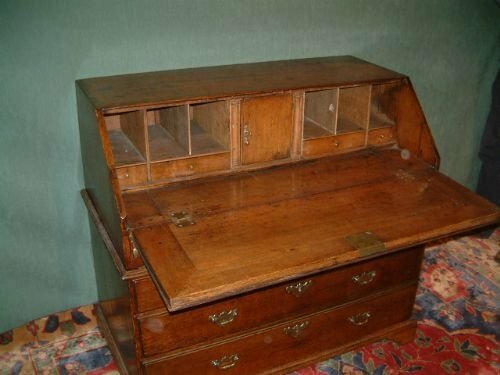 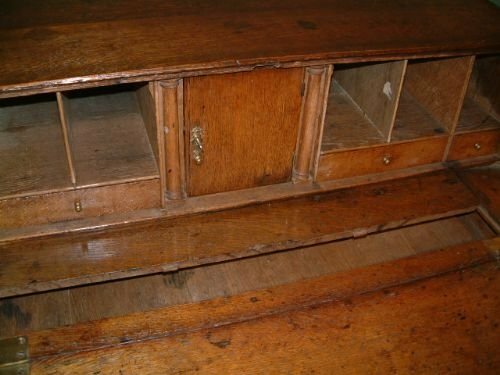 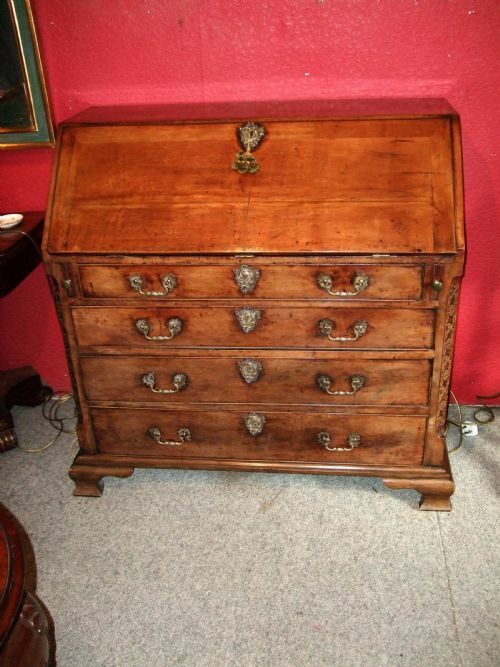 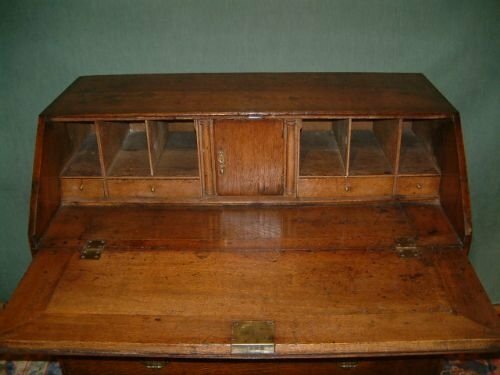 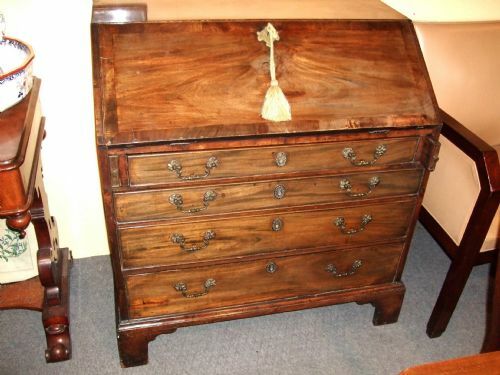 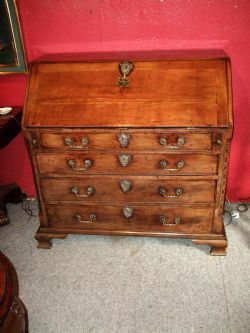 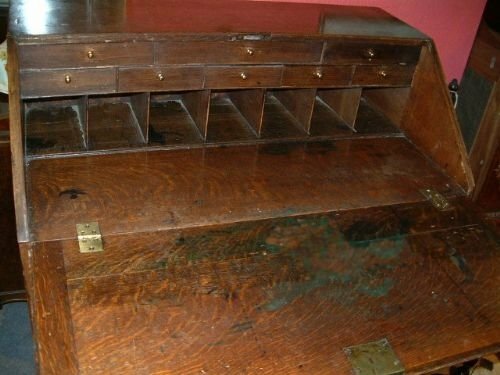 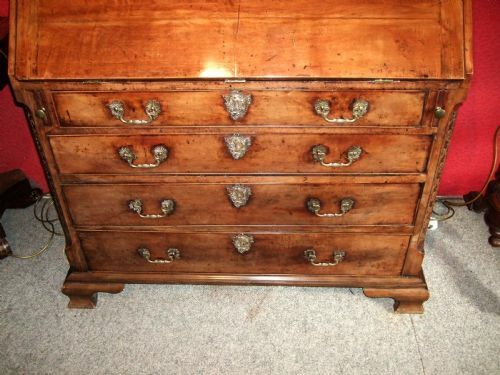 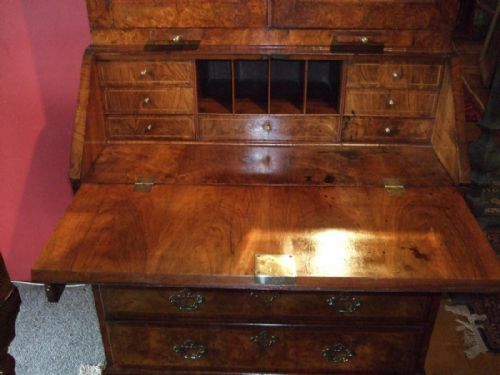 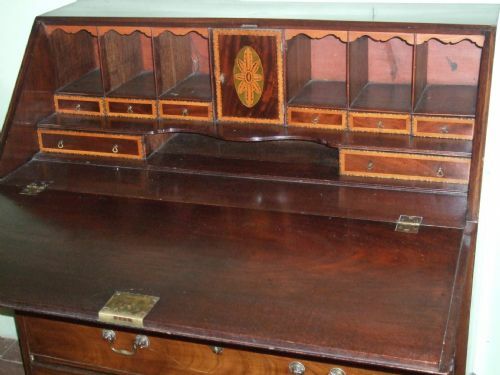 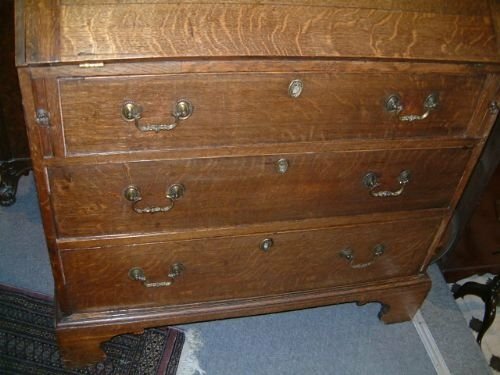 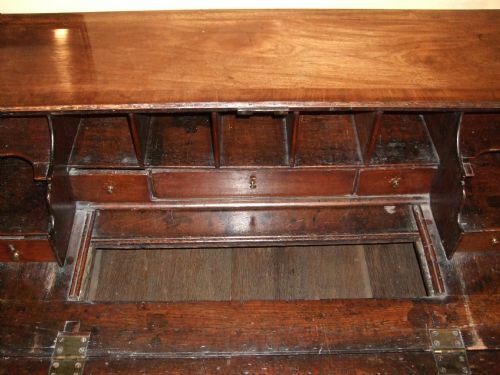 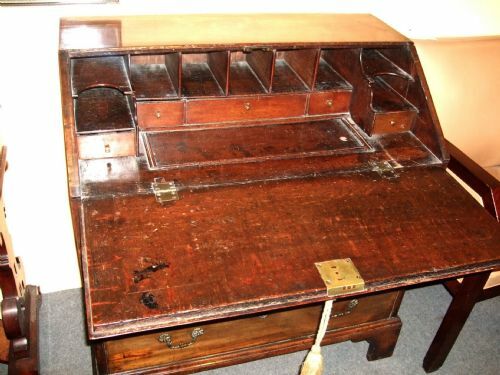 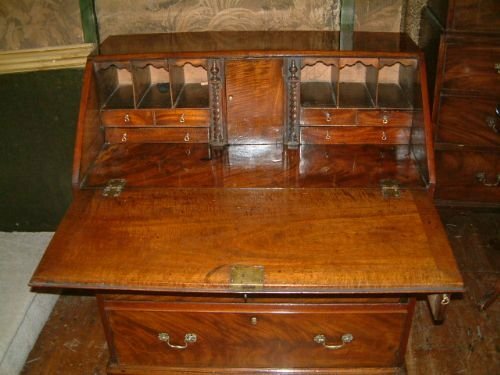 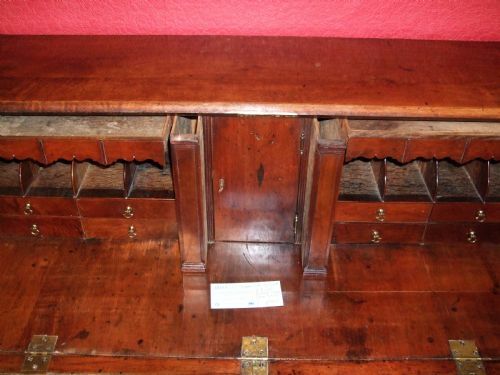 George 3rd Oak Bureau Nice Size with Fall Fromt Revealing Fitted Interior with Pigeon Holes & Drawers. 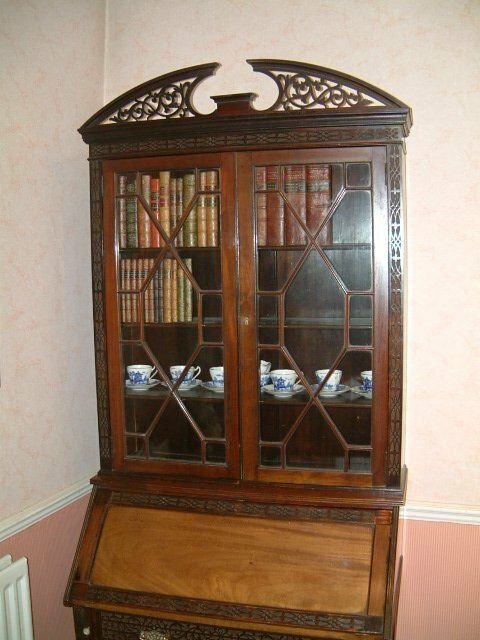 Edwardian Chippendale Revival Mahogany Bureau Bookcase with Pierced Swan Neck Pediment and Blind Fretting.